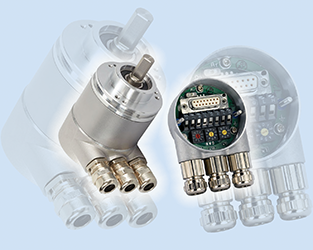 IXARC new magnetic absolute encoders with CANopen interfaces from POSITAL are now available with an optional “connection cap” that makes device configuration and troubleshooting simpler and more intuitive. For previous generation IXARC magnetic encoders with CANopen interfaces, device setup was accomplished by updating software parameters, requiring special tools and expertise. The connection cap contains three rotary switches that enable the installer to define the node ID and baud-rate directly with a small screwdriver. There are also diagnostic LEDs on the backside that simplify setup and debugging by indicating device and network status. With eight screw terminals inside the cap, the user can easily install cables for power supply and bus-in/bus-out. A slide switch can activate a termination resistor when the device is located at the end of the network, reducing installation costs. Compared to optical encoders, IXARC units are almost 30% smaller and have superior resistance to shock and vibration loads. Available IP 66/67 protection makes these devices suitable for harsh environmental conditions. Single- and multi-turn models are available. For multi-turn versions, the rotation counter is self-powered, with no need for backup batteries and with a measurement range of four billion revolutions (32 bits).